It may still be winter outside, but in my mind summer is starting. To help me beat the winter blues I dream of crunchy, sweet peas fresh from the garden melting in my mouth and hummingbirds whizzing past my ears. In my last post, Gardening Tips for Beginners, Part 1: The Potted Garden, I talked about starting a garden in pots. In this post I’ll share what I’m learning as I plan to create garden beds. The Vegetable Gardener’s Bible by Edward C. Smith is my main guide because it has thorough, simple steps for everything from choosing what material to use for raised beds to naturally controlling common pests and diseases. The decision for where to place the beds was based on where there is the most sun exposure, which means facing south without trees in the way. There are a lot of trees and brush to clear (thank goodness for my boyfriend’s strong arms! ), but soon enough we’ll begin creating the beds…I’m so excited! Mark where the beds will be with stakes and string. Deep fork (love that term!) the soil beneath where those beds will be, which means shoving a pitch fork into the ground and rocking it back and forth to loosen the soil. Ed says this will allow roots to grow longer and so be more productive. I’ll deep fork about 8 inches down. Build my boxes, making sure to build in support in the corners. I’ll most likely use untreated cedar because I don’t want nasty chemicals leaching into my garden. Put about 10 inches of topsoil and compost over the top, filling in to about two inches from the top of the wall. Let the soil settle for at least one week. Nestle in my plant baby plants and watch them grow! One of the biggest things I’ve learned is that gardeners always have more to learn, so if you have gardening tips, tricks and treasures, please share! 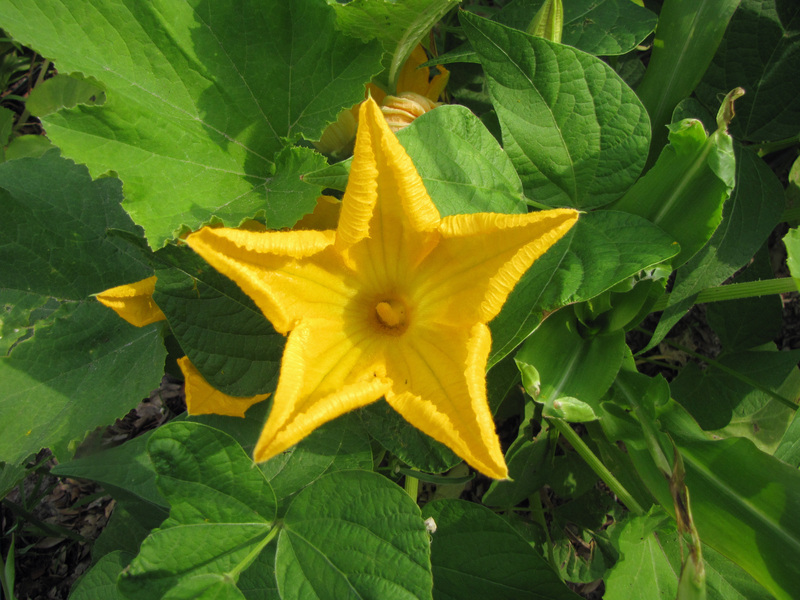 A cold, gray day in January is a great time to plan a summer vegetable garden! Imagining warm sunshine on your back back as you pop a sweet, juicy cherry tomato in your mouth is like offering the mind a warm cup of tea. A garden can be as simple as a few inexpensive pots on a porch with a few plants, or as complex as my friend Cari Schumaker’s giant garden, which provides a large amount of food year-round for her family of five. In this post I’ll share tips on beginning to garden in pots. In my next post I’ll share what I’m learning for creating garden beds. Over the summer I’ll share how it’s going, and in the fall I’ll write about what I’ve learned. If you’re new to vegetable gardening and have any trepidation, as I did, please know that it’s actually so simple you’ll wonder why you didn’t start sooner! If gardening is old news to you, passing on the joy of gardening to those who haven’t experienced it yet is a great new year’s resolution. I started gardening a few years ago in a few pots on my porch. Even though I had a tiny budget, almost no knowledge and limited space, I harvested cucumbers, chard, a few tomatoes, basil and a few other herbs. I loved coming home from work and taking care of my plants, as well as the fresh tastes in my meals. For the last few summers I’ve had a little more room and have experimented. Now I have the budget, time and space for a larger garden, so I’m planning to create raised beds for a wide variety of vegetables, herbs and flowers. I found an excellent book to help me plan and I thought I’d share some of what I’m learning with you. 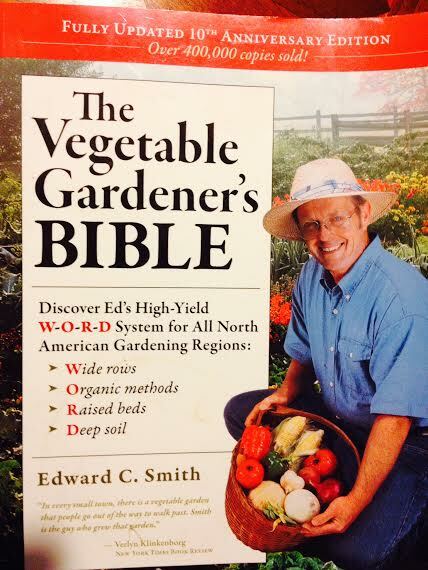 The book is The Vegetable Gardener’s Bible by Edward C. Smith. He also has a good book called The Vegetable Gardener’s Container Bible: How to grow a Bounty of Food in Pots, Tubs and Other Containers. To start, any nursery will have inexpensive pots and potting soil. Farmers markets and nurseries will have plant starts – and staff will happily give you planting tips. Once you have all your pieces, all you need to do is put them together and pay attention as they grow – water before they get dry, check for issues such as disease or bugs (ask those same farmers market or nursery staff if you get these) and then harvest your goods! Don’t be attached to the results. If your plants thrive, that’s wonderful! If they die, it isn’t the end of the world and you aren’t a terrible gardener. Think about what could be done differently and try again, and maybe talk to someone at a farmer’s market or nursery about your experience. Just keep trying – you will succeed! Get pots with drainage holes and put plates or pot bottoms under them so you don’t get dirty wet spots underneath. Without drainage, roots will likely rot. Get a good fertilizer and follow the directions. Everyone seems to have a different favorite – just ask your friends at the nursery or farmers market where you get your plant starts and/or supplies and experiment to find your favorite. Plant things you’ll actually eat. I’ve found that more than half of my lettuce goes to see before I eat it. That’s precious space that could be used for the carrots that I’m still harvesting in January! Be realistic about what you’ll actually eat and start there, then add more in future years. Check water levels daily until you know how much they require. It’s important not to overwater plants or let them dry out. Get in the habit of poking your finger up to the first knuckle into the soil every day – if it comes out dry, it’s time to water. Try to avoid watering over the top of your plants. If you water directly onto the soil, rather than over the top of leaves, you can help avoid mildew, which can spread through plants quickly and kill them, or at least drastically reduce their production levels. Gardening is a continuous learning process. There are thousands of books out there to choose from to get started and the choices can be overwhelming. The important thing is just to start! Here are my two favorite gardening books right now. Please let me know if you have other favorites and/or gardening tips! McGee and Stuckey’s Bountiful Container: Create Container Gardens of Vegetables, Herbs, Fruits and Edible Flowers (also a staff pick at Powell’s Books).